This week we’re featuring another beautiful member of the Modern Day Missus community, Rachel S. Rachel is a fantastic follower of Modern Day Missus, and always comments on my Facebook posts, with tips and details of the yummy food she is cooking! 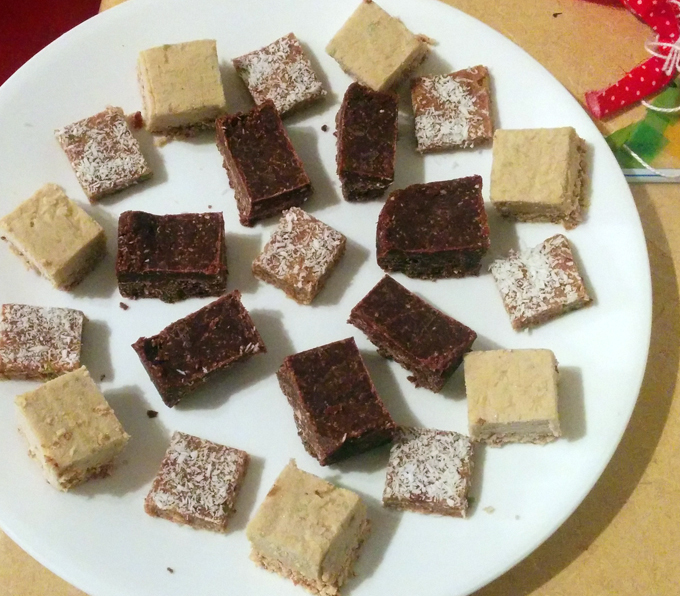 I mean, look at the pic of raw desserts from Rachel at the end of this post…. they make me want to eat my computer screen! Yummmm. Describe your eating/life style in one sentence: I try to eat a mostly wholefood, mostly vegan and substantially raw food diet getting as much nutrition and flavour by employing both tried and experimental food preparation techniques and I maintain an active healthy lifestyle for the best health possible. Main reason for choosing this lifestyle: I want to live a long, healthy happy life and be there for my family (especially my kids…..who arrived in my mid to late 30’s and I have to chase after as I enter my 40’s!! !….yes I mean “chase” quite literally). Main reason for sticking with it? I feel great and I feel and apparently look younger than I did 10 years ago! Number one lesson learnt since embarking on this lifestyle: If you think your diet is healthy, there are probably still things you can do to make it healthier. (I was a lacto ovo vegetarian since my last teens and reasonably active and at the high end of a healthy weight range. I thought that was good enough……I was wrong). What would you say is the biggest challenge? Convincing my parents / siblings (who aren’t even vego) that my diet is good / something they might like to try!! Typical breakfast: Green superfood smoothie or other smoothie, cup of chai with almond milk, two stewed prunes, psyllium and LSA. Typical dinner: I batch cook and we have rotating favourites during the week with a few surprises thrown in days I don’t work / weekends. Generally it is brown rice and curry, vege burgers on home made buns (or lettuce), stirfry and slim pasta, almond bolognaise…..my slow cooker is my friend! What is your go-to recipe? I generally make things up but my burger recipe which was based loosely on an idea from “here’s the veg” sausage roll filling is great for burgers, veggie loaves and “meatballs”. I can’t live without…. My food processor / blender – came on hols with us! My family, my music. Do you exercise? (if so, how often and what type) Yes. I do 30 mins of cardio / weights in the am (T25 evercise videos) plus walk about an hour 3-5 times a week, weekly yoga and on Tue and Wed most weeks I run with my three year old in the pram behind my son on his push bike to school and back (2km each way approx) in the mornings and pick up time. Oh, and I started karate with my 5 year old and we train an hour each Sunday! On the weekend, where will we find you? In my kitchen or chasing kids or at music (choir / instrumental rehearsals). Favourite quote: Today is the first day of the rest of your life. How good do these look! Thank you so much Rachel. We’ll have to get the recipe for some of your desserts! If you’re a member of the Modern Day Missus community, we’d love to include you too! Just flick me an email at robyn@moderndaymisuss.com and I’ll flick you a copy of the questions. While everyone is welcome in the Modern Day Missus community, in the spirit of the blog though, please only submit vegan meals. I’m sure you understand. Another great little interview Robyn – love this series you’ve started! These are so much fun to read and I would definitely love the recipe for that last picture! The other ones are a kind of made up lime slice – vegan cheesecake type thing from a modification of this recipe (see my comments) http://www.wholefoodsimply.com/lemon-slice/ – I used dates rather than syrup to sweeten. I am terrible about doing things by taste and feel and not writing them down but I think these recipes I followed. Also another fantastic recipe which doesn’t even really need a food processor (unless you want to use date puree rather than maple syrup) and is nut free is this baby…..yummmmmmmm : http://www.therawtarian.com/raw-sesame-seed-bar-recipe I have made a new batch today with some substitutions (including swapping most of the syrup for date puree).